Do you want to record your voice and to edit it in a video? or want to record a song that you want to show to your friends? Want to edit or cut a song that you have, to make a ringtone. You don’t want to learn audio editing course to do such silly things. All things can do with some free audio editing tools. Using such tools will help you to record songs, cut and paste songs and save it to another file format suitable for your needs. Here is a list of free audio editors, that you can use to play with your audio files. Audacity is the first free tool we are introducing to you. It is an easy-to-use, multi-track audio editor and recorder for Windows, Mac OS X, GNU/Linux and other operating systems. You can use Audacity to record live audio through a microphone or mixer, or digitize recordings from other media. You can record live audio or can import sound files to the editor. Once added, you can edit them, combine them with other files or new recordings. You can cut, copy, splice or mix sounds together without any effort. You can easily convert tapes and records into digital recordings or CDs with it. WAV, AIFF, FLAC, MP2, MP3 or Ogg Vorbis sound files are supported. Do you want to include files in formats like AC3, M4A/M4R (AAC), WMA and other formats, just use the optional libraries. The software supports 16-bit, 24-bit and 32-bit samples. You can export your finished audio work in many different file formats, including multiple files at once. 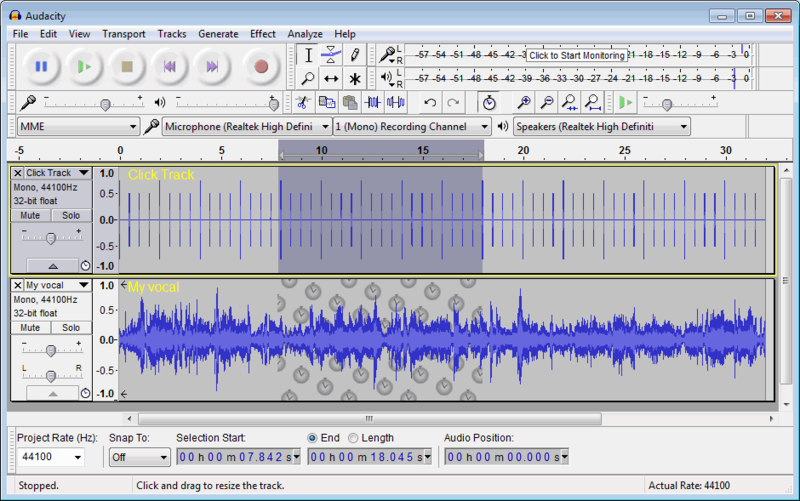 Ocenaudio is also easy to use, cross-platform audio editor. You can easily edit and analyze audio files without complications. ocenaudio software is based on Ocen Framework, a powerful library developed to simplify and standardize the development of audio manipulation and analysis applications across multiple platforms. Applying effects such as EQ, gain, and filtering is an important part of audio editing. This is very tricky to get the desired result by adjusting the controls configuration alone – you must listen the processed audio. To ease the configuration of audio effects, ocenaudio has a real time preview feature – you hear the processed signal while adjusting the controls. Ocenaudio is a cross-platform audio editor, available for all major operating systems like Microsoft Windows, Mac OS X, and Linux. This audio editing software is also a full-featured audio and music editor for Windows and Mac. This tool helps you to record and edit music, voice and other audio recordings. When editing audio files, you can cut, copy and paste parts of recordings, and then add effects like echo, amplification and noise reduction. WavePad works as a wav or mp3 editor, but it also supports a number of other file formats including vox, gsm, WMA, real audio, au, aif, flac, ogg, and more. The sound editing tools contain – cut, copy, paste, delete, insert, silence, auto-trim, compression, pitch shifting, and others. Audio effects contain – amplify, normalize, equalizer, envelope, reverb, echo, reverse and others. Wavosaur is a free sound editor, audio editor, wave editor software for editing, processing and recording sounds, wave and mp3 files. Wavosaur has all the features to edit audio like cut, copy, paste,feature. It has tools to produce music loops, analyze, record, batch convert. Wavosaur supports VST plugins, ASIO driver, multichannel wav files, real time effect processing. A unique feature of this program is, it has no installer and doesn’t write in your system’s registry. You can use it as a free mp3 editor, for mastering, sound design. Sound forge is included in this list because it is an ultimate tool to edit audio files. You can record multichannel audio in ultra high quality. Sound forge becomes an essential tool for audio production due to its powerful editing tools, fast processing, and advanced workflows. Easy to record, edit, and enhance audio with the clarity of high-resolution. Edit precisely with innovative editing workflows and tools and deliver the perfect master for broadcast, CD, or streaming. You can select from thousands of included samples with the package and create unique sounds for your productions. You can record up to 32 channels of high-resolution multichannel audio via discrete inputs. Sound forge comes in different flowers like Sound Forge Audio studio, Sound Forge Pro and Sound Forge Audio Master suite having price $59.99, $399.95 and $599 respectively.